Visual scenarios and storyboards are ideal ways to explore and map the user experience, customer journey as well as organization process. 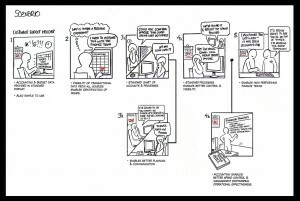 The scenario and storyboard visualization process synthesise thinking and experience in a way that connects it to the real world – describing in vibrant detail and colour what the human interactions, journey and experience look and feel like. The messaging can be tailored to targeted audiences as part of project design or change management initiative and/or engagement communications. Taking the form of a ‘day-in-the-life’ visual story; with a mix of carefully blended strategic and tactical messaging, scenario visualization is an ideal technique to support digital transformation, operating model design and embedding the new culture and way-of-working. Scenarios and storyboards are highly effective tools that enable leadership to communicate the key issues to local teams in a simple, balanced and human way – ensuring the stakeholders understand why the strategic change is important (the business value) and their individual relationship and role to make it happen. They are also an integral tool that helps align strategy with culture, behavior and decision-making. "It describes in vibrant detail and colour what the transformation looks and feels like."